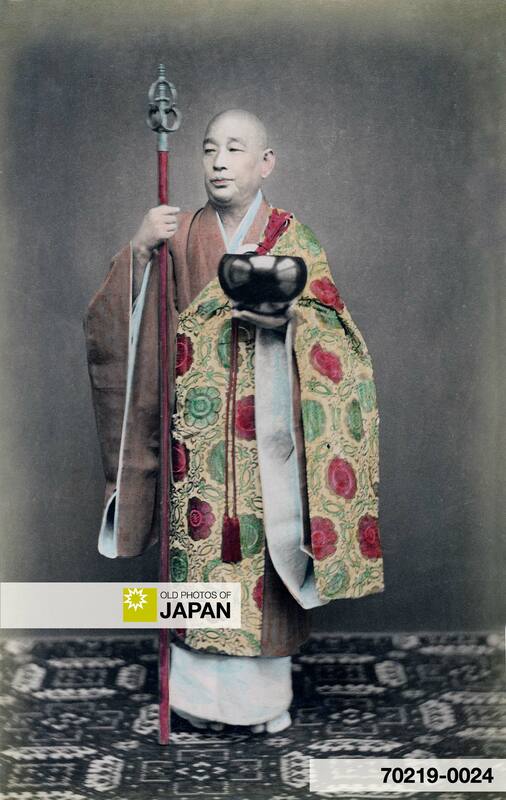 This Buddhist priest holds a begging bowl and a staff. He is wearing a monk’s stole, called kesa (袈裟) made of sumptuous silk brocade. Kesa are draped over one shoulder and under the opposite arm in order to wrap it around the body. They are believed to resemble a garment made for Buddha by his mother. Of a simple rectangular form, they have barely changed since Buddhism was first introduced in Japan during the sixth century. Kesa are classified into categories. In the Zen schools, there are three primary types of kesa, those with five, seven or nine strips of cloth. Each type of kesa is supposed to bring a different benefit to its wearer. A kesa with five strips removes greed, one with seven strips anger, and the one with nine strips ignorance.1 The kesa can be seen as a mandala, a symbolic rendering of the cosmos. The four squares in the corner represent the four directions, the column in the center symbolizes the Buddha, and the two squares on the side are his attendants. While in China, Dogen saw a Chinese monk pay respect to his kesa by placing it on his head every morning and reciting verses. He was deeply moved. The begging bowl shows the priest’s determination to give up earthly possessions. It used to be one of the only possessions that was allowed and was used by priests to go out to beg for alms. 1 Baroni, Helen Josephine (2002). The Illustrated Encyclopedia of Zen Buddhism. The Rosen Publishing Group, 188-189. ISBN 0823922405. 2 Cook, Francis Harold et al (2002). How to Raise an Ox: Zen Practice as Taught in Zen Master Dogen’s Shobogenzo. Wisdom Publications, 21. ISBN 0861713176. 3 Dumoulin, Heinrich et al (2005). Zen Buddhism, Volume 2: A History. World Wisdom, 94. ISBN 0941532909. 4 Heine, Steven (2004). Opening a Mountain: Koans of the Zen Masters. Oxford University Press US, 144. ISBN 0195174348. You can also licence this image online: 70219-0024 @ MeijiShowa.com. I believe the staff also has 6 rings at the top. I believe the rings symbolize of the realms such as the Hell reamls, human realm, etc.